This Iowa team really feels built for March, doesn't it? So deep. Balanced. Experienced. Great ball movement, great coach. I'd be surprised if "refs" isn't trending in Iowa City, because it definitely is on my timeline. Halftime: #Hawkeyes 45, #Cyclones 38. Iowa is the type of team that will score 90 and have nine different guys score 10 points a piece. Hawkeyes have many ways to skin a cat. Iowa like Noah's Ark. Two of everything. Impressed with depth. #Hawkeyes lead 33-24 with 5:08 left in half. 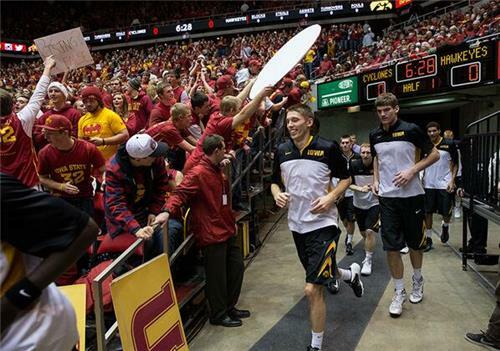 Always been a fan of Hawkeyes' Aaron White. Great energy with skills! 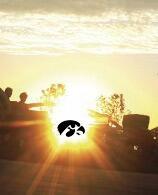 I've never seen a photo stolen as much as that sort-of Tigerhawk sunset. Side note: More #Hawkeyes fans believe in Ra than I thought. FYI #Hawkeyes RT @BTN_Iowa Due to technical issues, tonight's BTDN stream of @Hawks_Wrestling is canceled. Dual will be available on-demand. Happy 87th Birthday to @IowaHoops HOFer Murray Wier. He was a consensus first-team All-American during the 1947-48 season, avg'g 21 ppg.